The never-ending leaks coming from Capcom employees under the influence of alcohol continues, with Capcom's Senior Online Community Specialist Esby "Combofiend" Rosas having inadvertently leaked an unannounced update to Ultimate Marvel vs Capcom 3 during a late-night Salty Suite stream at this past weekend's Northeast Championships XIV tournament. Michael "Yipes" Mendoza, a well-known personality in the Fighting Game Community, remarked on the microphone during a live stream of an Ultimate Marvel vs Capcom 3 match, "I love the fact that, in Ultra [Street Fighter IV], you kinda stop the one player game... but we can't do it here", to which Mr. Rosas responded with, "Not yet [...] It's too soon", followed by an uncomfortable silence. Mr. Mendoza quickly changed the subject, sensing that Mr. Rosas desperately wanted to avoid discussing the subject any further. Numerous anonymous attendees of the Salty Suite have confirmed to FGCNN that Mr. Rosas had been drinking in the Suite, and, possibly, before he had arrived there, leading FGCNN to conclude that the statement made by Mr. Rosas on stream was unintentional and likely alcohol-related. This is not the first time that a previously-unannounced Capcom product has been leaked prior to an official announcement, and, certainly not the first time an announcement related to the Marvel vs Capcom series has leaked thanks to intoxicated Capcom employees. It is known that, in the past, information regarding the "Vanilla" version of Marvel vs Capcom 3 had leaked from an unknown source, and anonymous FGCNN sources tell us that these leaks came directly from a Capcom employee who was under the influence of alcohol at the time of the leak. 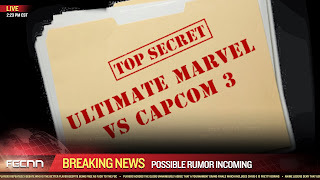 One of the individuals believed to be the original source of the first "Marvel 3" leak, known as "henaki", had intimated on numerous Internet postings, now deleted, that his information regarding the then unannounced Marvel vs Capcom 3, as well as a 100% accurate character roster for Super Street Fighter IV, were leaked to him by a Capcom employee that was under the influence of alcohol at the time of the leaks. This employee is believed to still be employed at Capcom, sources tell FGCNN. Do Capcom employees have an alcohol abuse problem? Does Capcom provide access to alcohol abuse programs and counseling to all of its employees? Are people reading way too much into what was likely an innocuous comment taken out of context? Let us know in the comments below!